With this 5.1-channel system, Mordaunt-Short is mindful of putting the buyer right in the customising hot-seat. Each model in the seven-strong line-up is available individually. You can select a configuration to suit your specific requirements. Also, you can tailor the number of speakers to your budget and add additional models to the system for six or seven-channel configurations. 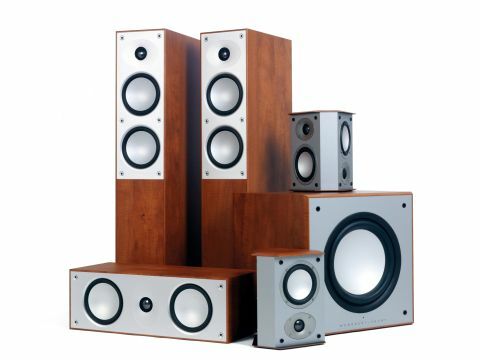 This 5.1-channel set up comprises two 906i floorstanders (£350), two 903i bipole surrounds (£180), a 905i centre (£120) and a 309i subwoofer (£230). Installation is straightforward and the system appears well constructed - the 906i and 905i front speakers are fitted with top-grade biwiring speaker connections. Behind the speaker grilles, the 906i floorstanders are a two-and-a-half-way design employing two 13cm mid/bass drivers and a refined metal dome tweeter for smoother high frequency performance. The lower of the two mid/bass drivers handles bass frequencies only, while the radial ribbing on the surface of both anodised aluminium drivers helps improve their efficiency. The matching 905i centre speaker employs identical drivers in a well-proportioned cabinet, and is perfectly voiced to match seamlessly with the floorstanders. The 903i surrounds used here are bipole models, fitted with smaller 10cm mid/bass drivers and matching tweeters. Their unusual design provides a more even dispersion of rear sound effects and achieves a subtler surround performance. They can easily be wall mounted via the keyhole slot at the back. The 309i subwoofer completes the 5.1 speaker package and is fitted with a 175W amplifier powering a 26cm long-throw bass driver. As well as level, crossover and phase control, there's also a notch filter to further integrate it with your room acoustics and the rest of the speaker system. When it comes to conveying movie soundtracks, the Avant 900i system is tough to beat at the price. With our Moulin Rouge test DVD, there's a tonal naturalness that lesser systems fail to deliver. Voices via the centre speaker are extremely convincing. Bass levels dig deeply with the aid of the well-tuned sub. The soundstage is remarkably airy. The main floorstanders also have a great sense of space. The Mordaunt-Short Avant 900i system is ideal for those looking for a full-size speaker package combining decent hi-fi and surround sound without breaking the bank.